Published: Nov. 18, 2018 at 05:01 p.m.
Tennessee Titans quarterback Blaine Gabbert finds wide receiver Tajae Sharpe in the end zone for a touchdown pass. Tennessee Titans quarterback Marcus Mariota throws an 11-yard touchdown pass to Tennessee Titans wide receiver Tajae Sharpe against the Philadelphia Eagles for Week 4. 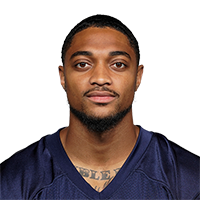 Published: Nov. 20, 2016 at 03:07 p.m.
Tennessee Titans quarterback Marcus Mariota finds wide receiver Tajae Sharpe for a 34-yard TD. Titans wide receiver Tajae Sharpe goes long for a 33-yard touchdown.